Bed and breakfast in Durham. Durham is a beautiful city, home to the magnificent Norman cathedral, Durham university and Durham Castle. The massive Cathedral is widely acclaimed as one of the world's finest buildings. Durham has a Medieval layout with narrow winding streets and a wide range of shops. Also see Durham & Durham attractions. If you are in the right town but cannot find the accommodation you want on this page, you might consider Durham hotels & self catering accommodation in Durham. Convenient location just off the A1 motorway. This hotel offers free Wi-Fi, and is just off the A1 motorway next door to the state-of-the-art Bannatyne Health Club, with free access to guests. The Bannatyne Health Club and the Bannatyne Hotel Durham offers a gym, swimming pool, Jacuzzi and sauna. As well as being easily accessible, The Bannatyne Hotel is only 2 miles (3.2 km) from the sights and attractions of Durham city centre. Guests can have meals at the health club near the hotel. Just one mile from Durham Railway Station and city centre, the Radisson BLU Durham has fantastic views of Durham Cathedral. The hotel boasts elegant rooms, a restaurant and bar. The en suite rooms all have a flat-screen LCD TV with satellite channels and minibar. Free Wi-Fi, a laptop safe and a dedicated work space are also standard. The Filini Restaurant offers modern Italian cuisine while the Filini Bar offers a wide range of cocktails and wines from around the globe. The Lobby Bar has a more casual atmosphere and serves light meals, coffees and snacks. Located on the banks of the River Wear, this Radisson hotel is one mile from Durham Castle and the cathedral. The hotel is just 10 minutes' drive from the A1(M) motorway and 30 minutes from the Penines. 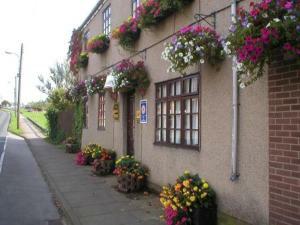 Dating from 1724, this traditional English country inn is located on the edge of picturesque Shincliffe village, 1.5 miles (2.4 km) from Durham and Durham University. Seven Stars Inn has a restaurant that offers freshly prepared food using the best seasonal, local produce. The traditional bar serves a good selection of Real Ales and fine wines. The Inn offers 8 en suite bedrooms. Set within a Grade II Listed Georgian townhouse, this unique hotel offers luxurious, individual rooms in the heart of Durham, each one with a theatrical theme. The Gadz Grill Room restaurant serves light lunches and a full evening menu featuring meat, seafood and other local produce. There is a garden terrace for al fresco dining, and a Jules Verne inspired reception area. Fallen Angel has views of Durham Cathedral and Durham Castle to the front. Durham University's cricket pitch and the beautiful River Wear are close by. The Fallen Angel is a 15-minute walk from Durham Train Station. The vibrant centre of Newcastle is just a short train ride away, home to wonderful shopping and a lively entertainment scene. Durham is less than 2 miles (3.2 km) away. The Lambton Hounds is a family-run, 250-year-old coaching inn offering 7 comfortable en suite rooms, cask ales and great-value homemade food. It is a traditional local pub with a bar taken from the RMS Olympic, sister ship of the Titanic. The atmosphere is friendly and inviting, and you will be warmly welcomed. Excellent 'park and ride' facilities are close by for easy access to historic Durham, which is less than 2 miles (3.2 km) away. In the heart of Durham's city centre, within easy reach of the A1 and less than 500 metres from the castle and the train station, this modern hotel offers great value and spacious, modern rooms. The Premier Inn Durham City Centre is just 5 minutes' walk from the historic markets and only 10 minutes' walk from the cathedral. The hotel has a 24-hour reception desk and some rooms can take 2 adults and up to 2 children (under 16 years). The city centre, with its numerous shops and restaurants, is only a short walk away. The train station is also close by. Farnley Tower provides stunning views over Durham Castle, the cathedral, and surrounding countryside. The hotel is a prominent Victorian mansion, renowned for its architecture and gardens. Dine in the award-winning Gourmet Spot restaurant and bar, specialising in molecular gastronomy. The menu features an array of local fresh produce and a huge choice of wines. All comfortable rooms are individually designed and have satellite TV. Some rooms have beautiful countryside views Farnley Tower is just a short walk from the town centre. Just off junction 62 of the A1(M) and less than 2 miles (3.2 km) from the very heart of Durham's city centre, the hotel offers comfortable, great-value rooms and free parking. The Premier Inn Durham East has a convenient location with easy access to the area's major roads. Durham Cathedral and the town's railway station are a little more than 1.5 miles (2.4 km) away. All of the large, clean and modern rooms have satellite TV and telephone/modem points. Some rooms can take 2 adults and up to 2 children (under 16 years). On the A167, north of Durham city centre and just a short drive from junction 63 of the A1, the hotel offers comfortable, great-value rooms, a family-friendly restaurant and free parking. The Premier Inn Durham North has a convenient location, with easy access to the area's main roads. Durham Railway Station is around 2.5 miles (4 km) away, as is the very heart of Durham's city centre. The hotel has a 24-hour reception desk and some rooms can take 2 adults and up to 2 children (under 16 years). Set in the heart of Durham City. Kings Lodge Hotel offers a cosy bar, good food in Finbarr's Restaurant and easy access to Durham city centre. Kings Lodge Hotel stands next to Flass Vale Nature Reserve and is walking distance from Durham Rail Station. There is free parking on-site. The comfortable bedrooms have tea/coffee and room service. Some bedroom have free Wi-Fi access. Durham Cathedral and the shopping area is about 15 to 20 minutes' walk away.